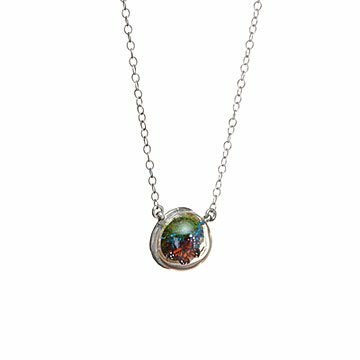 Keep wonder close with Cameron and Rebecca Stern's tiny, ethereal world in a pendant. Writer Roald Rahl said, "Those who don"t believe in magic will never find it." But we know you"re a seeker of enchanted things, or you wouldn"t have landed on this necklace. Cameron and Rebecca Stern capture a tiny, ethereal world in their beautiful pendant. Inside the clear resin bubble there's a miniature butterfly resting on moss. Even in our bustling day to day, the marvelous piece reminds you to stay curious and open to wonderful possibilities. Handmade in New York. .4" H, .7" Dia, Chain: 18"
Wipe down with jewelry cloth.